Lyric Masters uses songwriting to encourage secondary school students to write for pleasure and purpose. 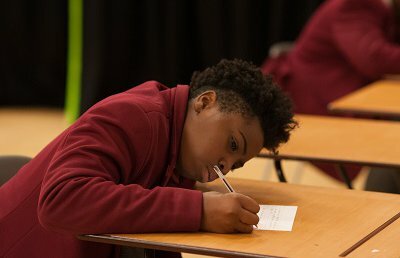 A young person who enjoys writing is eight times less likely to be below the expected level for writing attainment than their peers who don’t enjoy writing. Through taking part in Lyric Masters, students will explore the art of songwriting and learn how to write their own songs, working with a professional songwriter. Lyric Masters uses the power of music and songwriting to motivate students to write more frequently and write for pleasure. It also encourages them to express themselves more freely and creatively, finding meaning and purpose in the work they are producing. Lyric Masters is a pilot programme which is only being run with selected schools this academic year. If you'd like to receive updates about Lyric Masters, sign up to our expression of interest form now. Use these videos in the classroom to help you deliver Lyric Masters lessons. Young City Poets gives pupils the opportunity to visit famous cultural venues in their city, using the visits to inspire poetry. Read more about children’s and young people’s enjoyment of writing in 2016, taken from our seventh annual literacy survey. This report explores the writing enjoyment, behaviours and attitudes of 8 to 11-year-olds in the UK in the 2017/18 academic year.